A new health-focused, iOS-connected device claims to be able to measure a user's fat burning state with just one breath, helping make real-time decisions about diet and exercise to optimize fat loss. 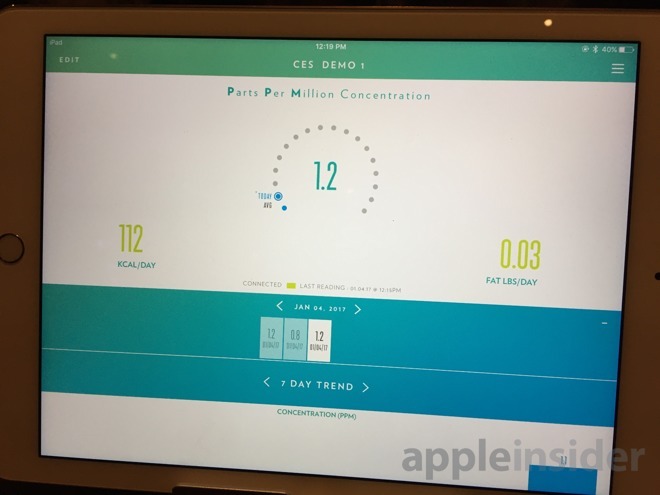 AppleInsider went hands on this week at CES and offers a first look. The LEVLpro is intended for trainers and medical professionals, helping their clients achieve fat loss goals with targeted, highly specialized data. Users simply blow into the LEVL, and a proprietary nanosensor detects a molecule in the breath to see if they are burning fat. 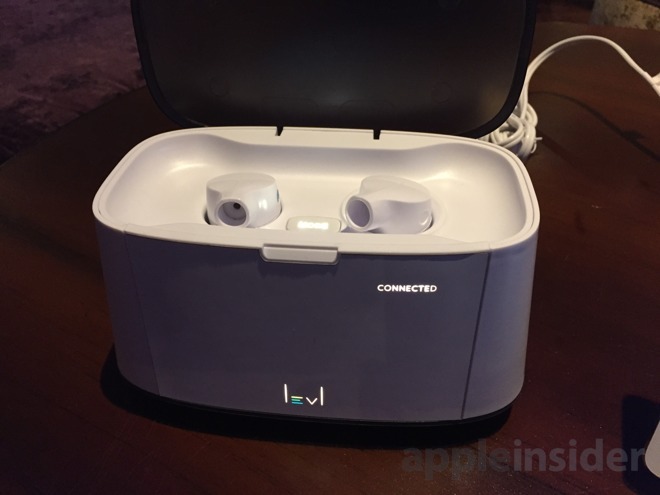 Data is then shared immediately with LEVL's app for iOS, which was demonstrated at CES on Wednesday via a connected iPad. LEVL officials say their technology is based on a half-century's worth of "proven breath science research." While we can't comment on the scientific accuracy of the LEVLpro, AppleInsider did come away impressed with our demo on the show floor. 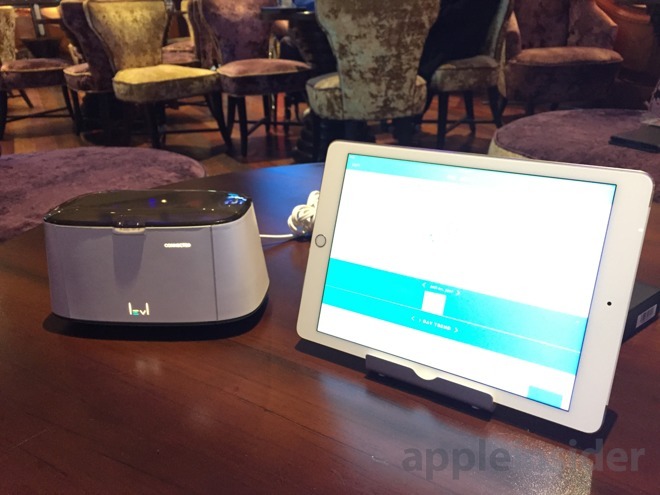 Users can blow into the tabletop device, and the LEVL sensor measures the concentration of acetone in the breath, providing a score that appears on the device. Data is also synced to the LEVL app for iOS, and wellness professionals can use the insights and projected fat loss data to adjust their client's routine. 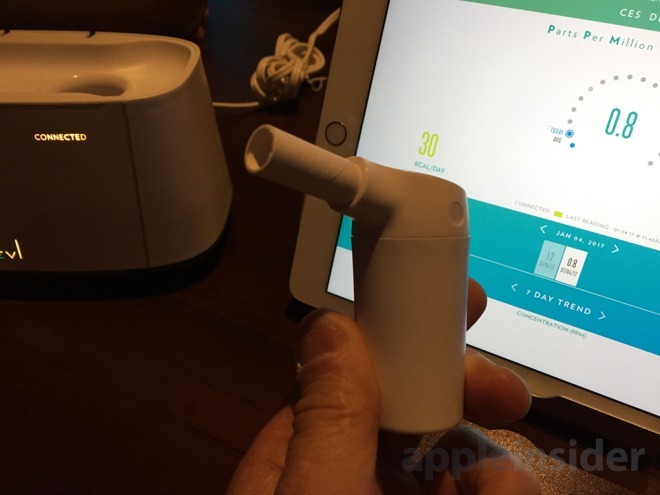 At its current stage in development, the LEVpro does not offer integration with Apple's HealthKit tools for developers. But officials with the company told AppleInsider on Wednesday that they see the value of Apple's Health app and they view it as a natural fit for their product. As a professional-grade device, LEVL sees the LEVLpro as an ideal candidate for gyms, training studios, nutrition centers, or wellness clinics. Payment plans are intended to be offered for $199 per month for 12 months, targeting trainers with a number of clients. LEVL also told AppleInsider that the company is working on a more affordably priced consumer solution. It hopes to announce a more basic version of the device sometime in early 2017. X-Gym founder and fitness expert P.J. Glassey has been testing the LEVL technology with clients in a study since October, and claims his clients are losing weight faster and more efficiently than he's ever seen. "The beauty of LEVL is that every reading is good news, because I'm helping them figure out their own personal physiology, and we are able to make changes to their health and wellness plans immediately, to help them achieve their fat loss goals," Glassey said. "In the past, it's been a lot of trial and error, and it can take months to achieve results. With LEVL, we are seeing that timeline cut down to weeks."